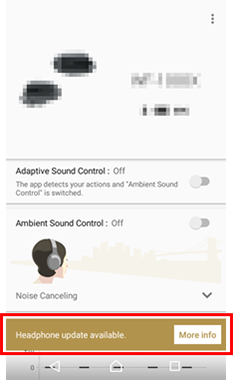 In order to use Amazon Alexa with this product, you will need version 5.0.0 (or later) of the "Sony | Headphones Connect" application. Note: Google and Android are trademarks of Google LLC. 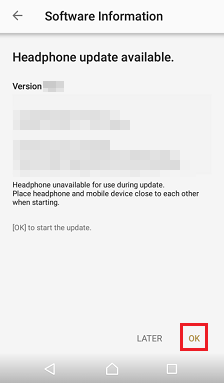 The latest version of the "Sony | Headphones Connect (v5.0.0 or higher)" application must be installed. If the firmware of your WF-1000X / WH-CH700N is version "4.2.0" or above, you do not need to perform the update. Connect your WF-1000X / WH-CH700N to the "Sony | Headphones Connect" application. Confirm the WF-1000X / WH-CH700N firmware version. DO NOT "insert the main unit into the battery charger" or "Power off" while downloading/transferring data/updating, otherwise the headphones may become unusable. Make sure both devices (Android/iOS device and WF-1000X / WH-CH700N) are fully charged. Once updated, the firmware cannot be reverted to an earlier version. Make sure that the right and left headphones are connected to each other. To confirm the connection, please press a button on the right-hand side and check that the blue light flashes every 5 seconds. If there is no flash or the flash appears every 1 second, please put the product into the case and try again from the beginning. Verify that "Version 4.2.0" is displayed and press "OK" to start the update. 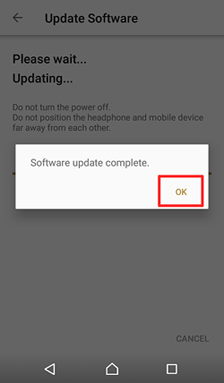 After the update, store the headphones into the battery charger and then remove the headphones from the battery charger, and confirm that the new version has been successfully installed by following the steps in the [Check the firmware version] section. If the firmware version shown is "4.2.0", the upgrade was successful. Restart (turn the power off then on) the WF-1000X / WH-CH700N. Even though the update failed during the process, check the firmware version. If the Version is shown as 4.2.0, the firmware update was successful. If not, try the firmware update again. 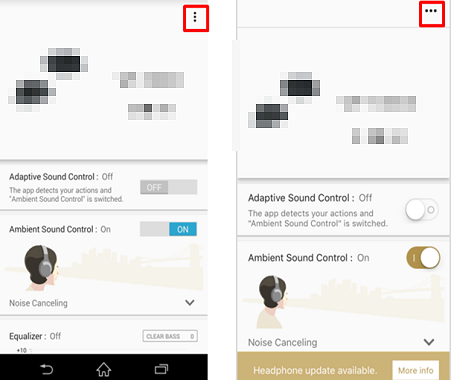 You can check the Version from the setting in the "Sony | Headphones Connect" application. To find out how to check the version, go to the "Check the firmware version" on this page. You may find some related information on the following page.